I started writing this post on Father’s Day. I couldn’t finish it and went back to it a few times. I thought of deleting it many times because it is painful and shameful. I know it is wrong to feel this way and yet I cannot “unfeel” it. Believe me I have tried. I have reached a much better understanding of the reasons why and how this happens to me after being triggered by my father and that helps but it doesn’t take away the realities behind the pain, shame and battle. I have not written many posts about PTSD even though I have it. I am not sure exactly why I haven’t but maybe it is because it is a difficult place to visit. Since I have been off psychotropic medications I have found my feelings, emotions and memories are clearer. They are mine. Mine alone without the interference, mask and band-aide of psychotropic medications. Nothing is covering up or masking the painful memories when they are triggered. Those memories are closer to the surface and I am now forced to learn to deal with them alone without the aid of psychotropic medications. I am ready to conquer this new obstacle because the good of being psychotropic medication free far outweigh the bad, so far at this stage of my life and living with bipolar disorder, anxiety and PTSD. Even though this post is difficult for me to share, I decided to tackle it, conquer it and share it with the hope that I can help someone else. Hopefully, others will be able to relate and can share their insights as well. Maybe my post will educate and inform others a little of what PTSD is like—at least for me. Father’s Day has always been a difficult day for me—not because my father has passed but because of the past with my father and sometimes even his presence today. I often read and hear so many beautiful and wonderful things most people say about their fathers. They say words that express their deep love and appreciation for their fathers. Words that explain how much their fathers did and do for them and how their fathers taught them many valuable life lessons. I am happy there are great fathers in the world. Children need their fathers. I am happy others have great relationships with their fathers, but that is something I never had. I know my father did the best he could as a father. I also know my father loved me in his own way. He just didn’t know how to show love appropriately and how I needed it. I can’t say I feel the love he has for me, but my brain tells me he loves me. I believe my father thought somehow he was doing the right thing when he physically and verbally abused me when I was young. I was and still am afraid of my father. My father was and is unpredictable with his behavior and mood. You never knew what you were going to get and we still don’t. I was never sure of anything with him. I never knew when or how he was going to yell at me. I never knew when he was going to be angry or maybe happy. I never knew when he would say something stupid, cruel or mean. I was afraid of what would come out of his mouth when we were alone and around other people. My father embarrassed me and made me feel embarrassed and ashamed of myself. I always thought it would have been easier if he was an alcoholic because than I would have an excuse for his behavior. His unpredictable and embarrassing behaviors could have been easily explained with alcohol use or drug use being the reason. I would have felt better to be able to say he is a wonderful person when he is not drinking but that was not our reality. I know he has some sort of mental illness but refuses to get help or accept he has something wrong with him. In fact, the opposite is true. My father believes he is always right and there is never anything wrong with him but with everyone else. Everyone else in the world is wrong but him. I truly believe he is trying now and does the best he can. I think inside, somehow, he has a good heart, but mental illness and his own past trauma interfered with his ability to be happy and be the person he could have been. When my father was about ten years old, he was forced to stay with his suicidal grandfather and was there when his grandfather (my great-grandfather) jumped out his window and died by suicide. That was just part of his trauma which had to have a negative impact on him. Many times, I felt sorry for my father because I don’t know if he ever felt real happiness and joy. I prayed he would one day find true happiness and feel the love from the Lord and learn to live in a way like Jesus would. I prayed he would have clarity of what was right and good. No matter how hard I tried and how much I do love my father I cannot control my brain. I cannot control PTSD. I developed PTSD at a young age from my almost daily abuse from my father and mother. My father is my greatest trigger, however. As hard as I tried to put up a brick wall to barricade my triggers, they still sneak in. I cannot stop them. Of course, I can help it with good coping strategies and positive self-talk sometimes, but I can’t make it go away, until it seems it is ready to. PTSD has a mind of its own—seemingly not my own. Because the memories are so painful and real they cause me to dissociate. 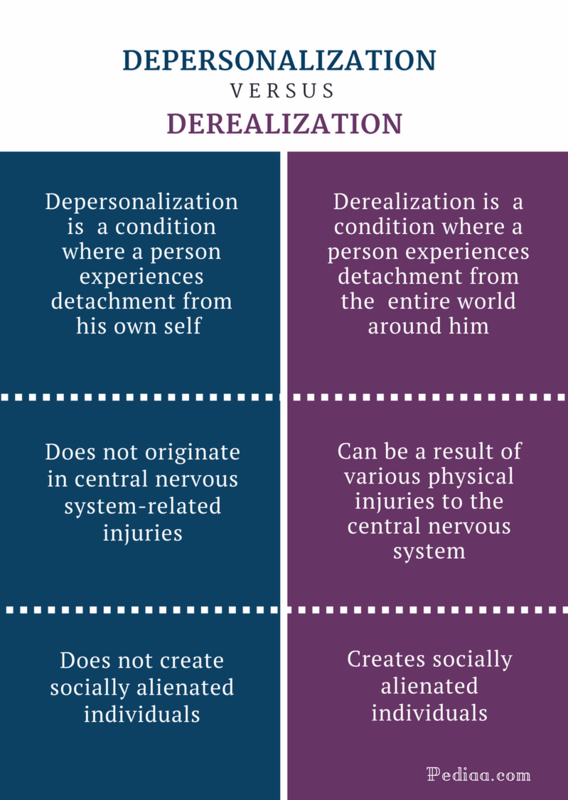 Depersonalization and derealization are forms of dissociation. Depersonalization involves a persistent or recurrent feeling of being detached from one’s body, mental processes, oneself and identity. Derealization is a feeling of being detached from one’s surroundings. They both make you feel disengaged. You feel like things are “less real” than they should be. You lose touch with yourself and/or surroundings kind of like you are living in a dream you cannot wake up from. My dissociation caused me to leave myself so to speak. I wasn’t fully present in myself. It is as if I am watching from behind a thick fog or out in the distance from myself. I become discombobulated and can’t make myself come to the surface of my own reality enough to accomplish my activities and goals for the day. I become stuck and undone. That is what happened to me this Father’s Day for the entire day. I could not snap out of it as “they say.” I could not positive self-talk myself out of it. My writing didn’t distract myself enough to make it go away. I wasn’t sad or angry. I was unsure what my emotions were or felt void of emotions. I was numb. When I was young, my brain learned how to keep me safe and protect me from my environment and myself. Now I cannot undo that, and I must be patient and wait for it to stop. I have learned to forgive my father, but my brain will not let me forget, even though I want to. This is PTSD at its finest. I realized recently that not being on any psychotropic medications has sometimes caused me to be more aware and have more clarity. I also believe it has made me become more aware of my PTSD. I do not have any medications to ease or mask my pain. I must use my own inner strength and coping skills more often now. When I called my Dad to wish him a Happy Father’s Day, I could tell immediately he was in one of his moods. The last time I talked to him on the phone he was in good spirits and tried very hard to stay up-beat and positive. Today he obviously woke up on the wrong side of the bed. My natural instinctive thought was to hang-up right away, but I didn’t. It was Father’s Day. I would be strong and talk to him. After all, I love to make people happy, including my father. I managed to speak to him for quite a while and told him I loved him before ending our phone conversation. About twenty minutes after I stopped talking to my father, it hit me and I became undone. I left. Triggers hit, and PTSD struck back hard. Dissociation had begun its game of protection. Dissociation never asked me if I wanted to participate in this game. It just took over my day. My brain protected me and kept me safe from dangers from my past and for that I am thankful. For some reason, my brain cannot distinguish the past from today. This is PTSD. I could not do anything for the entire day. I was stuck, discombobulated and frozen—frozen inside myself. I sat in front of the television set all day fighting my brain. I battled constant thoughts and desires of wanting to do something and the refusal and blockage inside my brain to move or do anything other than sit in front of the television set immobilized. I was frozen within myself. I survived my long day and went to bed. Happily, when I woke up the next morning I had been put back together. Dissociation left, and I came back. I wrote this poem titled, “I Left My Anxiety in the Dust” shortly after Father’s Day. I referred to my symptoms as anxiety. Sometimes it is difficult to distinguish which mental illness is the culprit when you have more than one diagnosis. Plus, anxiety can cause dissociative like symptoms and anxiety can be caused from triggers, PTSD and trauma. i can relate to an extent. i know how conflicted the entire issue may make you feel. you are extraordinary for surviving this. a very personal and painful message. Please know you are thought of and prayed for! God loves you! I have a similar problem with my father, plus my father and both grandfathers died within the two months one year leading up to Father’s Day. This is why I have two reasons to “Lock Up” on Father’s Day. Thank you for talking about your experience. Maybe someday I will be able to talk about mine. Thank you for bravely sharing your story. You are strong and that’s something you should be proud of. You are an inspiration. I had the “same” kind of father, although he was an alcoholic too. Oddly though, it was my mother who had me experiencing what you describe. I couldn’t handle Mother’s Day. I tend to just ignore it as best as I can now. I have friends who wax poetical on Mother’s Day, and I try to be appreciative that they had that relationship. Mainly I just don’t read. I had a full blown panic attack in a Hallmark store once around Mother’s Day. At that time I was still, grudgingly, going through the motions of “send a card.” As I stood in the aisle reading the cards, trying for the least sloppy, more humorous cards, I just started shaking. Nothing in the store applied to me and my malignant narcissist of a mother. I dropped the card in my hand and staggered, ran, cried out of the store. I guess I drove home, apparently without killing anyone on the road. While reading your post I realized that I almost could have written it word for word myself. Except, my fathers trauma, was losing his father at the young age of twelve years old then doing two tours in Vietnam. It is totally uncanny yet overwhelmingly soothing to have a past so similar to someone else who is a complete stranger. I deal with these triggers constantly and they have altered and affected my life a great deal. Thank you for so eloquently sharing this personal and so very similar burden of our youth. Thank you for sharing! I am also working to deal with PTSD and past trauma. Hope you can find things to help! Medication can help you manage symptoms, but I have realized that it doesn’t heal anything. Emotional trauma needs emotional healing. Keep sharing! You have a community here.